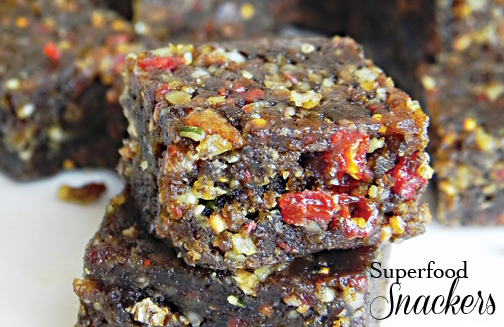 If you’re leaving treats out for Santa tonight, these Superfood Snackers from Practically Raw Desserts by Amber Shea Crawley will give him the energy boost he needs to make all of his deliveries. Because they don’t contain refined sweeteners, they won’t cause the sugar crash that traditional cookies do. If there are any leftover, you can keep them in the freezer almost indefinitely, and reach for one anytime you need a little boost. In a food processor, combine the walnuts, hempseeds, Brazil nuts, açaí powder, greens powder, maca powder, and salt. Pulse until the nuts are coarsely ground. Add the diced figs, goji berries, and mulberries and pulse until uniformly incorporated. Add the dates and pulse until the mixture becomes sticky (try not to overprocess). Press the mixture firmly and evenly into a 6- to 8-inch square baking pan (lined with plastic wrap or waxed paper for easy removal, if desired) and score into small cubes. Enjoy immediately, or place the pan in the refrigerator or freezer to chill and firm up for a couple hours before cutting and snacking. Store the cubes in an airtight container in the refrigerator for up to 3 weeks or in the freezer for up to 3 months. ▪ Açaí, greens, maca powders: 1 1/2 to 2 tablespoons powdered superfoods of your choice, such as cacao, camu camu, maqui berry, mesquite, pomegranate, etc.